Celebration special wishes are best delivered by gifting this Remarkable Gift Manifest to your family and friends. 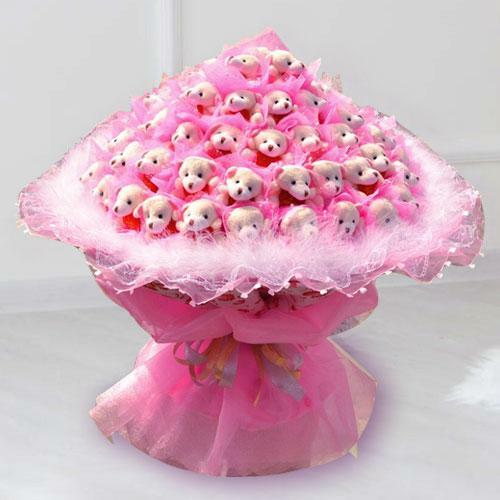 This exclusive 30 Pcs Teddy Arrangement is designed with Baby Pink Tissue Cotton Cloth in the form of a Bunch tied with Satin Ribbon. Flowers Delivery Ajmer, Send sweets Tanjore, Wedding Cake Margao, Diwali Mithai Gwalior, Send Flowers and Gifts to Sikar, Online Shop Jaipur, Flower to Secundrabad, New Year Flowers Munnar , Fresh Fruits Rishra, Send Gift Kannur, Dry Fruits to Kanpur, Birthday Delivery Nadiad, Sending to Pondichery, Flower shop Hissar, Faridabad Online Cake Delivery.